With Mrs M and the cats back in the UK, I have plenty of time for doodling. 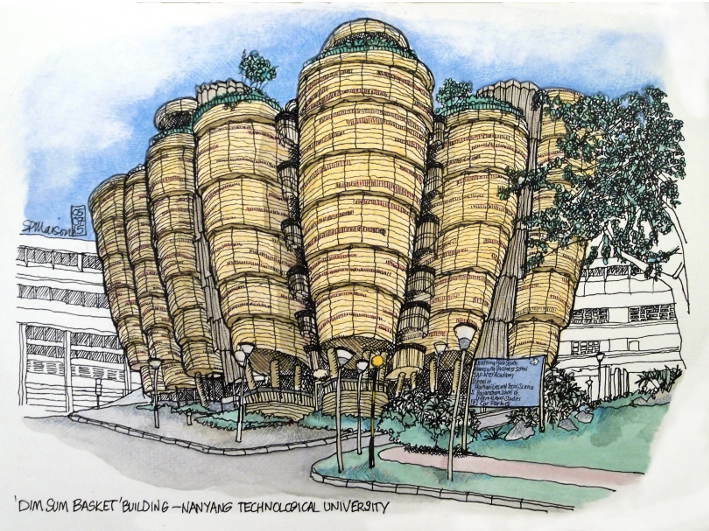 This morning I drove to Nanyang Technological University to draw the 'Dim sum basket' building designed by the British architect, Thomas Heatherwick. I sat for around three hours in the baking sun, albeit with sun screen, hat and a towel around my neck for extra protection, but nothing stops sweat soaking clothing or dampening the paper from your drawing hand - I even disgust myself at times. Before returning home, I wandered up the stairs into the atrium which is still under construction. The eight concrete storeys are mounted on slightly curved pillars that are asymmetric and resemble crudely hewn logs. There is hardly a straight line to be seen. The walls are covered with pink concrete panels with raised designs by another Brit, Sara Faneli. I am not sure they needed the shrubberies. Hi there, I really love your sketches. Would like to ask how I can contact you via email because I hope to use some of these sketches of Singapore for a project. Hi Teacher Lee - email steve dot maison at gmail dot com and let me know what you're looking for.